Mary is a thirty-four year-old single woman who lives in London. She has ended a significant relationship in the last few months, but is still carrying inside the emotional remnants of that relationship. Does she want him back? Mary is not sure, until a new being enters her life...a red fox that is prowling the urban wilderness where she resides. At first, she thinks the fox, because naturally it is the same one, is trespassing on her garden, but eventually he starts leaving her gifts that may or may not have hidden messages. She becomes rather fond of him, and their relationship quickly evolves. Is it love? Her neighbors want to catch the foxes—they are pretty sure there must be many—, or exterminate them, if possible, but Mary ends up taking matters into her own hands to safeguard the well being of her newly found lover. 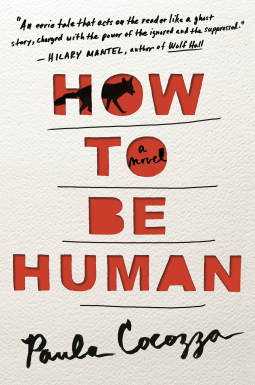 How to Be Human is a unique, imaginative first novel. It is rather short, and beautifully written. It is a literary page-turner so delightfully quirky, that when I wasn't laughing out loud, I was chuckling. However, I wasn't fond of the events leading to the ending; I thought that the story took a weird turn, fitting within the context, but too weird to make me fully love it. DISCLAIMER: I received from the publisher a free e-galley of this book via NetGalley in exchange for an honest review. "Quirky" sounds like a good adjective to describe this novel and quite often that is a good thing. Too bad that you found the ending disappointing, but the overall story seems to have a lot going for it. I loved most of the novel, but it is one of those stories that doesn't have highs or lows, and it gets tiresome after a while, or maybe I've been too distracted lately to really love what I have been reading. As I was reading your review, I thought that such a story might take a weird turn. I have heard of this novel and now you have made me curious. The turn was weird but fitting. I guess I was fretting and didn't see the end anywhere in sight. Hmm. I hadn't heard of this fox story, but it sounds different -- and imaginative as you say. Sorry the ending didn't work for you. I often find that happens to me too, sometimes twists can have negative effects. This novel was released on May 9 of this year. What a shame the ending didn't quite live up to the rest of the story. It left me puzzled, to be honest.